A major new account of the most intensely creative years of Luther's career The Making of Martin Luther takes a provocative look at the intellectual emergence of one of the most original and influential minds of the sixteenth century. Richard Rex traces how, in a concentrated burst of creative energy in the few years surrounding his excommunication by Pope Leo X in 1521, this lecturer at an obscure German university developed a startling new interpretation of the Christian faith that brought to an end the dominance of the Catholic Church in Europe. Luther's personal psychology and cultural context played their parts in the whirlwind of change he unleashed. But for the man himself, it was always about the ideas, the truth, and the Gospel. 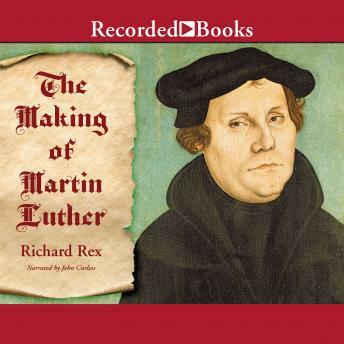 Focusing on the most intensely important years of Luther's career, Rex teases out the threads of his often paradoxical and counterintuitive ideas from the tangled thickets of his writings, explaining their significance, their interconnections, and the astonishing appeal they so rapidly developed. Yet Rex also sets these ideas firmly in the context of Luther's personal life, the cultural landscape that shaped him, and the traditions of medieval Catholic thought from which his ideas burst forth. Lucidly argued and elegantly written, The Making of Martin Luther is a splendid work of intellectual history that renders Luther's earthshaking yet sometimes challenging ideas accessible to a new generation of readers. Author bio: Richard Rex is professor of Reformation history at the University of Cambridge and a fellow of Queens' College. His books include Tudors: The Illustrated History and Henry VIII and the English Reformation. He lives in Cambridge, England.